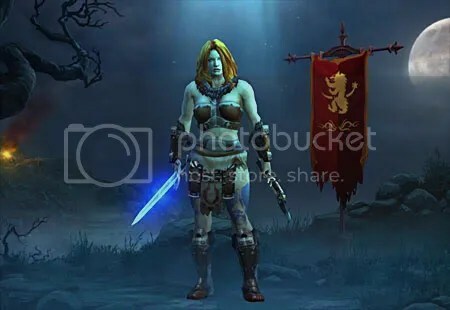 Yeah … I promise I’ll stop … soon, and if I don’t, at least I’ve located my Diablo screen shot folder in my Documents Library, so I can show you something other than her just standing there looking all mean and tough. But look what a difference a day makes. Direrage has a hat now, some shoulders and quite an attitude. She is somewhat annoyed with me right now. I’m not sure what I can do about it though. I’ll have to stop playing to do some reading. But I’m never much for reading directions. She was somewhat mollified when I found her this bloody huge two-hander that’s a yellow, right after I took her picture. I think yellow is Diablo’s version of SIMPLY SPECTACULAR. My problem is, I can’t find or seem to make her any gear with appropriate stats. She’s running around cleaving things in half, in clothes with intellect and dexterity. When crafting armor it says a random enchant, and I’m going broke making multiple pieces, hoping the random part will give me something I like. It’s almost as bad as making Mysterious Fortune Cards to sell. Most of mine never reach the AH as I flip them all. Obviously I need to do research, but my unwillingness to stop playing to gain information is slowly dwindling my gold supply as I doggedly continue to hope for the perfect enchant. The vendors seem to take an evil delight in offering me things that have big red Xs through them, sadistic bastards. This whole armor thing wasn’t an issue between us until we were tasked with taking down the Skeleton King. I’d go so far as to say Ms. Direrage was a tad overconfident in fact. Up to this point she’d been running around wreaking havoc, no complaints from her then about gear. So we get to the Skeleton King and after the encounter, which was her first death, all I could think was, YOU ARE NOT PREPARED! I know, wrong game and everything, but that is what I though. Well, you’ve made some kind of mistake. They couldn’t possibly expect you to take him down, really, could they? I must have wandered into the wrong place by mistake. I can never navigate in these crypty sort of places very well. I’m sure now that we’ve died, whatever glitch that was will have sorted itself out. So we went back, and no, he’s still there. So, long story short, second time we killed him, she had to face the fact that she wasn’t invincible and drink some health potions and let the Templar be beat on for a bit, which actually was quite refreshing, as all that yelling about rebuking evil and all can start to work on your last nerve. But HE IS a Templar after all, so sort of to be expected. After that was when all the moaning about finding her suitable gear started. Oh, and whining about my randomly hitting WoW appropriate keys and opening windows in the heat of battle which is a legitimate complaint, I’ll give her that. Hi Druid, wish you were here! Don’t worry, I’ll make it back in time for our daily appointment with Anzu. Direrage. Yeah, I got all dramatical and in the moment when I came up with her name. But yes, hi, that’s me! I enjoyed a few hours yesterday being a badass and beating the crap out of anything that moved. It was lovely, I must say. 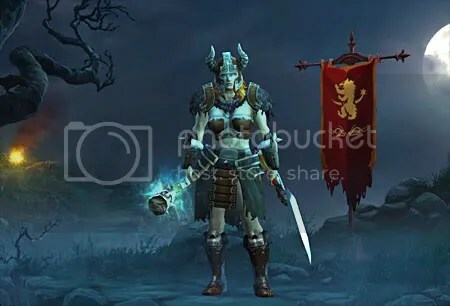 I had initially thought a Witch Doctor would be my first character, but on reading a series of posts on D3 aimed at new players at Blog of the Treant, I changed to melee. You will notice that moving and attacking use the same button, which can sometimes result in a squishy ranged character running over to the big scary monster and shooting it at point blank range. Generally, that doesn’t end so well. That would so be me, I just know it. I know I wouldn’t remember to shift+click in the heat of battle. So, Direrage the Barbarian was born. Clicking to move was strange at first, I think not being able to change the camera angle was the hardest thing to get used to for me. She (I’ll blame her) has some coordination issues. She really kind of looked like an exotic dancer as she mowed through the evil dead rising from graves. She kept missing the skeletons, and accidentally picking up gold like her fans were throwing tips at her. Luckily it didn’t seem to interfere; she is indeed a killing machine. I feel like a Warrior wearing spirit gear. I wear whatever I find pretty much based on how cool I think it is, and so far, not suffered any ill effects, she just keeps mowing everything down. I’m quite fond of her. I do have one little issue. I wish she’d show a little more emotion. In the middle of a big freaking battle I heard her say something in a calm voice … like she was commenting on the weather. Oh, lovely day isn’t it? Luckily the Templar was along and we both managed to survive. I looked to see what she had said to me. Can’t remember her exact words but it was along the lines of, I’m seriously hurt. Come on, don’t you think having her yell, WTF! WTF STUPID! I’M ALMOST DEAD HERE, A LITTLE HELP WOULD BE NICE, would have been better? Well I do. Oh, and I’m stumped. Went back to town with full bags intending to sell it all and I was offered the opportunity to train the blacksmith. I don’t know what to do. It would take half my money. Is it worth it? And then, I should salvage all that stuff rather than sell it. What to do, what to do. I am somewhat surprised. I have a history of getting excited about a game, logging in the first time and going … meh, and never playing again. So I hadn’t expected to enjoy D3 that much, but what little I saw I really liked. That girl can take on whole ROOMS of bad guys. LAMENTATIONS OF THE WOMEN WILL ENSUE!